If you listened to the story I reported in this week's Poultry Slam about Tom the Turkey, you know that Officer Jeff Day, the cop who actually shot and killed the bird, would not speak to us. At first he declined our request by phone, so my producer Brian Reed and I went to the Chilmark police station to try and convince him in person. We wanted to hear from the last person to see Tom alive. But when we showed up, Day responded by simply fixing us with an inscrutable gaze. 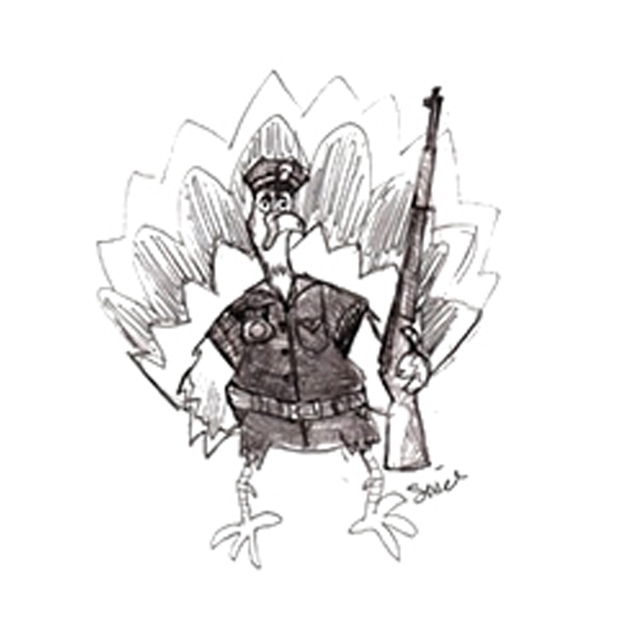 Maybe the dead eyes came with the territory – after all, this turkey had attacked Officer Day so viciously that he felt compelled to pump it full of lead. The slaying might have left quite a mark on the policeman. “Is it that you don’t like talking about the incident?” we asked. Day shrugged. Honestly, we were surprised. We thought people might be able to laugh about a turkey encounter three years after it happened. We asked Officer Day if any ongoing legal issues prevented him from speaking to us. A firm “No,” and a good old eyeballing was all that Day would muster. We appealed to his sense of compassion (“Brian drove through the snow from New York... I flew here from London”), his vanity (“people loved how you took down that bird”), even his common sense ("more than two million people will hear this, and your side won't be represented"). But it was like trying to get a rise out of a meatball sandwich. Day was unflappable. “Do you not like reporters?” Another shrug. This one seemed to indicate that, yes, Day was not a committed fan of journalists. But still, some other principle was at play that Day just would not tell us. “I couldn’t tell you,” said the officer. Perhaps Day just didn’t want to speak ill of the dead. 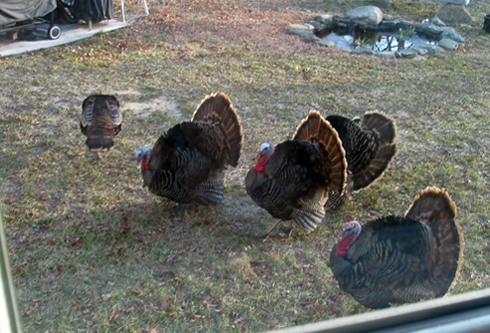 Pictured: Tom the Turkey and his gang (we're not sure exactly which one is Tom). Photo by Brian Mackey.